This is the most impressive and formal work known of Baccarini, left unfinished due to his death. The painting was sketched in Rome during the months of June-July of 1904. When he left Rome in 1904, Baccarini brought the painting to Faenza, where he attempted to finish it, but soon gave up and abandoned it. 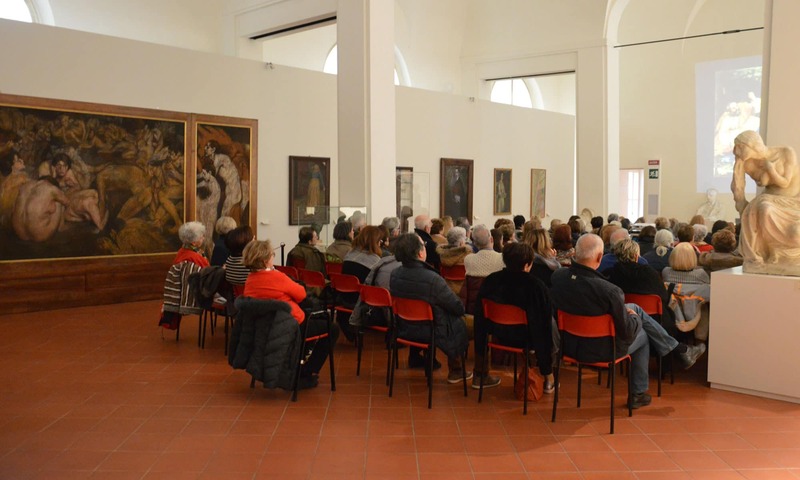 The triptych, wrote Claudio Spadoni, on the occasion of the show dedicated to Baccarini in 2007, «marks a profuse greater effort by this artist from Faenza for a hugely ambitious work. A pictorial panel that approaches the Expressionistic area, in aspiring to offer a moral narration, that is both magniloquent and unsettling. A tangle of nudes crouching or prone, in a circle in the central panel, where a single figure with the face of Bitta is facing the viewer. There is the echo of Michelangelesque drama in those earth-soiled nudes swarming as if they were figures in one of Dante’s circles. In the side panels, there is more naked and suffering humanity, almost modern damned without distinction of age, all sharing the same skin tone and immersed in a sinister atmosphere and in an undefined space».